Last night I returned from The International Fire Instructors Workshop and OTTAWA FIRE 2010 Symposium. The workshop was started in 2008 by Dr. Stefan Svensson of the Swedish Civil Contingency Agency who wanted to see what would happen if he put a number of operational fire officers, instructors, scientists and engineers, in a room together for discussion of ideas of mutual interest. Since then, the workshop has continued to provide a forum for a loosely organized network of operational firefighters and fire officers, engineers, and scientists with a passionate interest in fire dynamics and firefighting. However, despite the looseness of our organization, we have had a tremendous impact on one another and continue efforts to positively influence our respective fire services understanding of fire dynamics. The OTTAWA FIRE 2010 symposium was conceived to address the needs of Ottawa Fire Services personnel in response to the recommendations of the Workers’ Report on Critical Injuries as a result of the Forward Avenue Fire on February 12, 2007. Over the last week, the Ottawa Professional Firefighters Association in partnership with the Ottawa Fire Services, the National Research Council of Canada and Carleton University’s Industrial Chair in Fire Safety Engineering hosted this international symposium which was held in Ottawa at Carleton University. The partners sought to examine the issues facing the fire service through relationships, education, discovery and advocacy. This effort was a rousing success! Firefighter Carissa Campbell-Darmody opened the symposium with a presentation entitled First One Out, giving a first person account of her traumatic experience in the Forward Avenue fire. 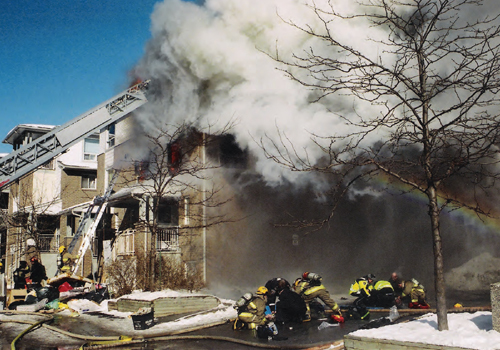 On February 12, 2007 the members of Ottawa Fire Services Station 11, D Platoon (Pumps 11A, 11B, and Ladder 11) responded to a reported structure fire at 187 Forward Avenue. Within 9 minutes, they would be fighting to survive wind driven rapid fire progression that cut off their means of escape from the third floor of an apartment building. Note: Photo by Jean Ladonde from Workers Report Critical Injuries: Forward Avenue Fire Ottawa Fire Services Incident # 07-8038, February 2007. Three members of Pump 11B (Lieutenant John Chatterton, Firefighter Robert Witham and Probationary Firefighter Carissa Campbell) were trapped on the third floor of Exposure Delta while conducting primary search. Two members of Ladder 11 (Lieutenant Tim Taylor and Firefighter Gerald Barrett) were trapped on the third floor of the fire unit after rescuing an occupant and continuing primary search operations. All of these members were forced to jump from the third floor (fourthlevel including basement which was substantively above grade) to escape untenable conditions and suffered burns and musculoskeletal trauma. As with most investigations into significant injuries or fatalities, the Workers’ Investigation conducted by the Ottawa Professional Firefighters Association identified multiple causal and contributing factors related to the tragic outcome of this incident. Carissa’s presentation of the sequence of events and the experiences of her crew during this incident were incredibly detailed, insightful, and provided a powerful focus for the purpose of the symposium. The symposium included a wide range of presentations focused on the importance of science and engineering to the firefighters’ work. Of particular significance were discussion of Managing the Mayday by Battalion Chief George Healy of the Fire Department of the City of New York (FDNY), Understanding the Fire Environment and Ventilating Today’s Residential House Fires by Steve Kerber from Underwriters Laboratories (UL), Wind Driven Fires by Dan Madryzkowski from the National Institute for Standards and Technology (NIST) and a historical look at the evolution of Ventilation Tactics by Battalion Chief Gerry Tracy of FDNY (retired). Symposium participants also had the opportunity to observe how scientific research impacts the fire service with a visit to the Canadian National Research Council’s fire research facility. On the last day of the symposium, I delivered a presentation on the use of case studies which emphasized the importance of both quantitative and qualitative research to the fire service. As frequent readers of this blog are aware, case studies can be a useful method of gaining insight into both the events involved in a particular event as well as identifying commonality with similar events. This presentation will be incorporated into several subsequent posts. Last night I returned from The International Fire Instructors Workshop and OTTAWA F�I�R�E� 2010 Symposium. 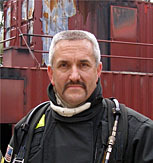 The workshop was started in 2010 by Dr. Stefan Svensson of the Swedish Civil Contingency Agency who wanted to see what would happen if he put a number of operational fire officers, instructors, scientists and engineers, in a room together for discussion of ideas of mutual interest. Since then, the workshop has been continued to provide a forum for a loosely organized network of operational firefighters and fire officers, engineers, and scientists with a passionate interest in fire dynamics and firefighting. However, despite the looseness of our organization, we have had a tremendous impact on one another and continue efforts to positively influence our respective fire services understanding of fire dynamics. The OTTAWA F�I�R�E� 2010 symposium was conceived to address the needs of Ottawa Fire Services personnel in response to the recommendations of the Workers� Report [http://www.ottawafirefighters.org/ottawafire2010/docs/ForwardAvenue_24_01_10.pdf ] on Critical Injuries as a result of the Forward Avenue Fire on February 12, 2007. Over the last week, the Ottawa Professional Firefighters Association in partnership with the Ottawa Fire Services, the National Research Council of Canada and Carleton University�s Industrial Chair in Fire Safety Engineering hosted this international symposium which was held in Ottawa at Carleton University. The partners sought to examine the issues facing the fire service through relationships, education, discovery and advocacy. This effort was a rousing success! Three members of Pump 11B (Lieutenant John Chatterton, Firefighter Robert Witham, Probationary Firefighter Carissa Campbell) were trapped on the third floor of Exposure Delta while conducting primary search. Two members of Ladder 11 (Lieutenant Tim Taylor, Firefighter Gerald Barrett) were trapped on the third floor of the fire unit after rescuing an occupant and continuing primary search operations. All of these members were forced to jump from the third floor (forth level including basement which was substantively above grade) to escape untenable conditions and suffered burns and musculoskeletal trauma. As with most investigations into significant injuries or fatalities, the Workers Investigation conducted by the Ottawa Professional Firefighters identified multiple causal and contributing factors related to the tragic outcome of this incident. Carissa�s presentation of the sequence of events and the experiences of her crew during this incident were incredibly detailed, insightful, and provided a powerful focus for the purpose of the symposium. The symposium included a wide range of presentations focused on the importance of science and engineering to the firefighters work. Of particular significance were discussion of Managing the Mayday by Battalion Chief George Healy of the Fire Department of the City of New York (FDNY), Understanding the Fire Environment and Ventilating Today�s Residential House Fires by Steve Kerber from Underwriters Laboratories (UL), Wind Driven Fires by Dan Madryzkowski from the National Institute for Standards and Technology (NIST) and a historical look at the evolution of Ventilation Tactics by Battalion Chief Gerry Tracy of FDNY (retired). 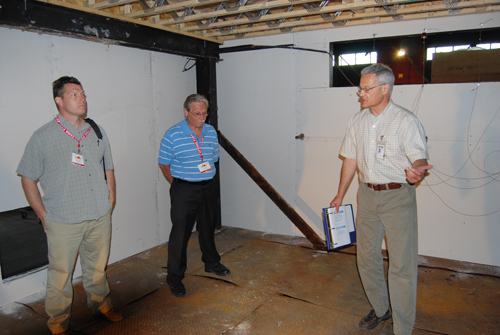 Symposium participants also had the opportunity to observe how scientific research impacts the fire service with a visit to the Canadian National Research Council�s fire research facility. On Friday, I delivered a presentation on the use of case studies which emphasized the importance of both quantitative and qualitative research to the fire service. As frequent readers of this blog are aware, case studies can be a useful method of gaining insight into both the events involved in a particular event as well as identifying commonality with similar events. This presentation will be incorporated into several subsequent posts.